With a mission that was anything but mundane, Soyuz MS-09 with its three-person crew returned to Earth after more than 6 months in orbit on the International Space Station. The Soyuz MS-09 vehicle rose to high public profile in August when a hole that resulted in a small atmospheric leak aboard the Station was discovered in its Orbital Module. That hole was determined to have been drilled on the ground during the spacecraft’s manufacturing and led to a rather dramatic spacewalk earlier in December that saw cosmonauts cut into the protective casing around MS-09’s Orbital Module to conduct further investigation of the issue. Wrapping up its mission, Soyuz MS-09 and its three-person crew from Russia, ESA, and NASA, undocked from the International Space Station at 20:42 EST (01:42 UTC on Thursday, 20 December) before landing on the Kazakh steppe at around 00:03 EST (0503 UTC) on Thursday, 20 December. When Soyuz MS-09 launched to the Space Station on 6 June 2018, the mission seemed like most others that had come before: nominal in almost every regard with the spacecraft successfully delivering its three-person crew to the International Space Station. But the spacecraft’s quiescent existence was shattered on 29 August 2018 when a small air leak was identified by ground controllers throughout the International Space Station, a leak that was quickly traced to a 2 millimeter hole in the Orbital Module of Soyuz MS-09. 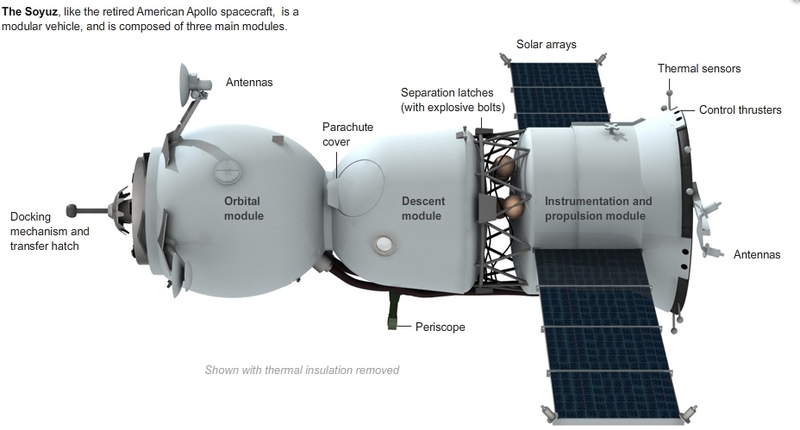 The crewed Soyuz transportation vehicles are comprised of three primary sections, the Orbital Module at the top which physically connects the vehicle to the International Space Station, the Descent Module in the middle within which crews ride to and from orbit, and the Instrumentation and Propulsion Module which contains the propulsion, power, electrical, and avionics systems for the craft. At the end of nominal missions, the only part of a Soyuz spacecraft that survives reentry is the Descent Module, with the Orbital and Instrumentation and Propulsion Modules burning up during atmospheric reentry. Once the hole was found, Station crew members immediately identified it as having been caused by a drill and reported the presence of material in the hole suggesting that is had already been sealed on the ground and that that ground seal had given way. 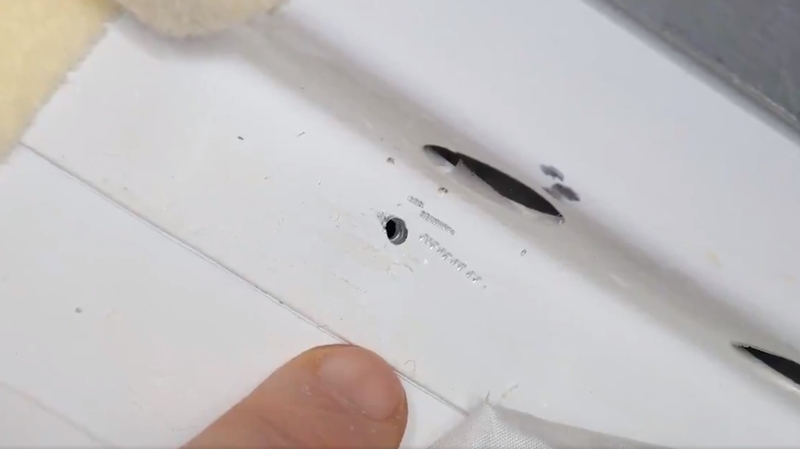 Over the objections of then-NASA Station Commander Drew Feustel and NASA requests to hold off on permanent repairs until an investigation and better understand of the hole was determined, Russian cosmonauts and Russian Mission Control quickly sealed the hole using an epoxy sealant. After those repairs, no further leaks were detected aboard the Station aside from the nominal atmospheric decay that occurs during each of the Station’s 16 daily orbital day to night passes. Official confirmation that the hole was caused by a drill was announced on 4 September 2018, though it could not be determined whether the hole was drilled intentionally during manufacturing – aka, sabotage – or was the result of a manufacturing error. Despite the admission, what was abundantly clear was that workers on the ground had identified the hole and sealed it in an attempt to cover it up, thus allowing Soyuz MS-09 to pass all pressurization and leak checks prior to launch. The presence of the hole and its undocumented fix also raised serious concerns about the safety and quality control methods in place within Roscosmos in building the as-yet-still only vehicle capable of transporting crew to and from the International Space Station since the retirement of the Space Shuttle fleet in July 2011. Perhaps serendipitously, the presence of the hole in Soyuz MS-09’s Orbital Module is arguably the best place the hole could have been since the Orbital Module does not survive atmospheric reentry. In short, the fact that the hole is in the Orbital Module means that it poses no threat to the safe return of Alexander Gerst (ESA), Sergey Prokopyev (Roscosmos), and Serena Auñón-Chancellor (NASA). However, the fact that the hole made it through safety and quality assurance checks before launch also raised serious questions of whether other holes exist throughout the Soyuz MS-09 vehicle – a question which cannot be answered with certainty until the craft returns to Earth. An even greater spotlight was thrown onto Soyuz MS-09 on 11 October 2018 when the Soyuz MS-10 crew vehicle was forced to perform an in-flight abort to pull itself away from its failing Soyuz rocket just over two minutes into flight. The Soyuz MS-10 launch failure, also attributed to a lack of quality control within Roscosmos, only strengthened and raised the concerns of safety and quality assurance within the Russian human space program. Nonetheless, Roscosmos was quickly able to determine the reason for the Soyuz MS-10 launch failure and successfully launched the Soyuz MS-11 crew up to the International Space Station on 3 December, setting up a delayed but still more or less on time landing for Soyuz MS-09 on 20 December. However, since the Soyuz MS-09 Orbital Module will not survive reentry, Roscosmos was forced to perform a spacewalk, or EVA, to tear into the outer protective layer surrounding the hole to take photographs and collect samples that will aid in the still-ongoing official investigation of how the hole was drilled in the first place and how the undocumented ground repair occurred. The rather dramatic looking spacewalk took place on 11 December, with Russian cosmonauts Oleg Kononenko and Sergey Prokopyev cutting into the thermal blankets and pulling away insulation in order to examine the Orbital Module’s outer hull. The EVA clearly revealed the hole, allowing the needed samples and photographs to be collected without issue. With Soyuz MS-09 now undocked from the International Space Station, the crewed craft performed two orbits of Earth and various small trajectory burns to bring itself into proper alignment for its critical deorbit burn. The more than 4 minute long deorbit burn began at 23:09 EST on Wednesday, 19 December (0409 UTC on Thursday, 20 December) and decreased Soyuz MS-09’s velocity to lower the craft’s perigee, point of closest approach to Earth’s surface, into Earth’s atmosphere at a precise point to allow the Soyuz’s Descent Module to land at its primary location on the steppes of Kazakhstan. Following the deorbit burn and a brief coast, commands were sent to separate Soyuz MS-09 into its three constituent parts, with the Orbital Module (containing the hole) and the Instrumentation and Propulsion Module burning up in Earth’s atmosphere while the Descent Module orients itself heatshield first for atmospheric entry. During the Descent Module’s reentry, the immense speed of the craft combined with friction with air molecules will create a plasma flow around the vehicle which can – and usually does – cause temporary communication blackouts with the crew. Perhaps more importantly than other Soyuz reentries, it is important to stress that these communication blackouts are to be expected and are not, in themselves, any cause for concern during the entry process. Also important to stress is that aside from the nominal reentry profile, the Soyuz’s Descent Module can also perform what is known as a ballistic style reentry – a much steeper and harsher reentry – designed to get a crew to the ground as quickly as possible if a systems or orientation issue is identified by the spacecraft’s computers. This type of ballistic reentry was last seen during the Soyuz MS-10 launch abort in October and has previously occurred in October 2007 and April 2008 during back-to-back Soyuz landings of International Space Station crew members. 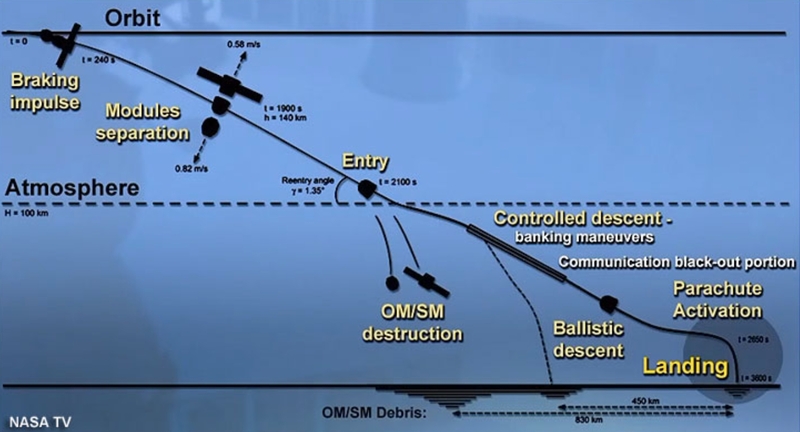 Had a ballistic reentry occur during the Soyuz MS-09 landing , it wouldn’t be indicative of or immediately connected to the hole in the Orbital Module, which will have already been jettisoned by the point a ballistic reentry would be triggered during the entry sequence. 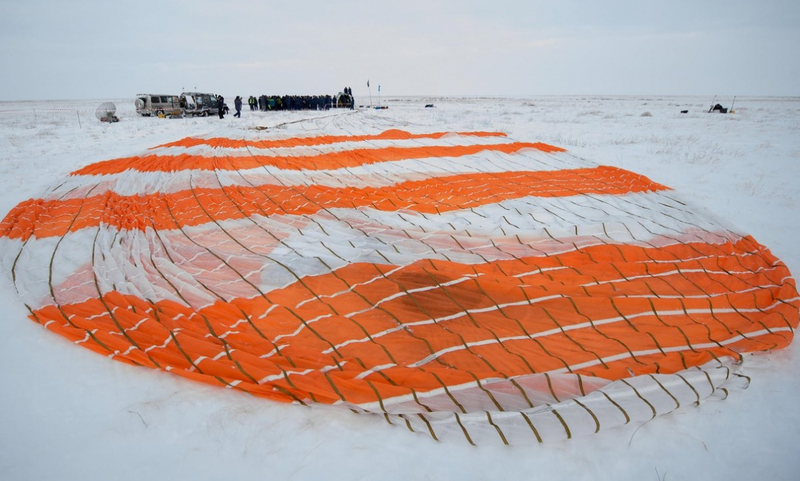 However, a nominal reentry and landing occurred, with Soyuz MS-09’s Descent Module touching down under parachute and last-second retro rocket firing at around 00:03 EST (0503 UTC) on Thursday, 20 December on the Kazakh steps.